Tag line: "The genius behind the music. The madness behind the man. The untold love story of Ludwig von Beethoven"
The great composer, Ludwig van Beethoven (Gary Oldman) is dead, and his longtime secretary, Anton Schindler (Jeroen Krabbé) is attempting to sort out his estate. While looking through the maestro’s papers, Schindler uncovers a letter that Beethoven addressed to his “Immortal Beloved”, bequeathing his entire fortune to this mysterious woman. Hoping to learn her identity, Schindler interviews several ladies who, at one time, were intimate with the late composer, including Giulietta Guicciardi (Valeria Golina) and Anna Marie Erdödy (Isabella Rossellini). Then, just as Schindler is ready to abandon all hope of finding the “Immortal Beloved”, he stumbles upon new information that leads to a very shocking discovery. 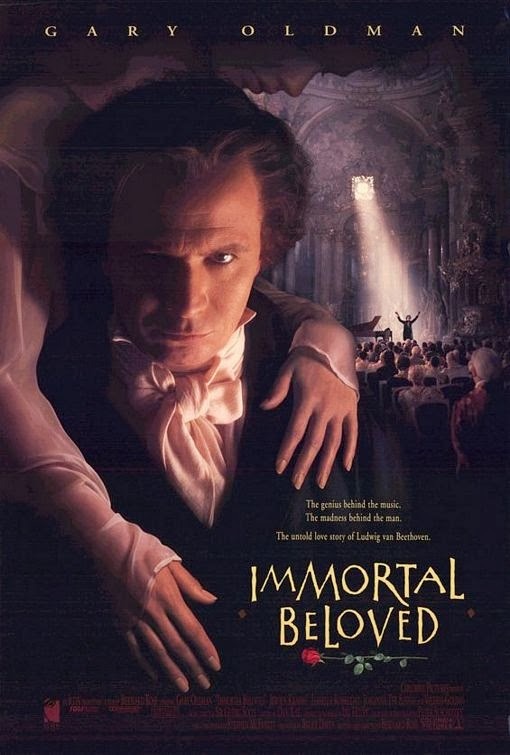 Bernard Rose’s Immortal Beloved works as a mystery, following Schindler on his quest to find the woman who captured Beethoven’s heart (the letter to the “Immortal Beloved” is based on an actual correspondence found among Beethoven’s papers after his death). But the film’s greatest strength is the way it delves into the composer’s past, functioning as a biopic of sorts by presenting the man’s genius (Beethoven’s music is played throughout, concluding with a rousing performance of his 9th symphony); his turbulent private life (following the death of his brother, from whom he was estranged, Beethoven obtained sole custody of his nephew, Karl, taking the boy away from his mother); his hearing loss (there’s a heartbreaking scene where Beethoven attempts to conduct an orchestra, resulting in laughter from the audience when he makes a mess of it); and his arrogance (he had little time for other musicians, who he often insulted, and was rude to those he considered his inferiors). Gary Oldman delivers a stellar performance as Beethoven, evoking our sympathies one minute, our anger the next, yet remaining, at all times, consistent in his portrayal of this incredibly complex man. The supporting cast is also effective (especially Rossellini as Anna Marie Erdödy, who suffers a few personal tragedies of her own), but Immortal Beloved is the Gary Oldman show, and never once does the actor disappoint. Director Rose does eventually identity who he believes was Beethoven’s long-lost love, though historians argue his candidate couldn’t possibly have been the actual “Immortal Beloved” (in reality, she was never found). But no matter; presented within the context of this movie, Rose’s resolution works, and offers a surprising plot twist as well. So, even if Immortal Beloved is bad history, it’s good filmmaking, spinning a marvelous tale of romance that features one of history’s finest musicians.